Buffalo -- my hometown, and Leonard Pennario's -- is in the news as one of the Top 10 Best Places to move to. Yahoo News is trumpeting it today. With Buffalo it is one extreme or the other. We are either among the very best or the very worst. And usually we are at the No. 2 slot, not No. 1. A few years ago we were the second fattest city. New Orleans was the fattest! And now we are the second-best place in the country to move to. Pittsburgh is the first. It is fascinating to look over this Best Places thing. You have to admire the guy, Burt Sperling, who got it rolling. He set up this Web site and appointed himself arbiter and maybe now it is making a living for him. Why didn't I think of that? I would have more time to work on my book, that is for sure. I love how the picture included with the story -- that is it up above -- spotlights our Skyway. 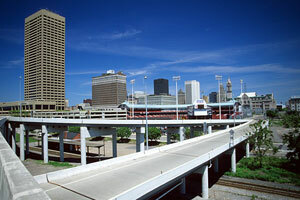 There is this big griping in Buffalo that the Skyway should go. I always loved it. And Best Places apparently agrees with me. Who knew Buffalo was nicknamed "City of Trees"? I never heard that and I have lived here all my life. At first I thought it came from a band called the Trees. That was a band Howard used to play in. But we are apparently the "City of Trees" because of all our parks. The article kindly does not mention that our parks are dumps compared with other cities' parks. Look at Delaware Park, with boom cars all over the place and an expressway full of trucks running through the middle of it. In general I think Mr. Best Places has us right. Buffalo is a good place to live. I like it here. I like it now with apples in season, plus I am ready to head to the Clinton-Bailey Market and broker my first half bushel of squash. But one thing about this Best Places thing makes me uneasy. That is because two things great about Buffalo are our relatively inexpensive houses, and our nonexistent traffic. I do not want those things to change! Perhaps we should not be getting the word out about how great we are. I think better to keep it quiet.